Send Me Private Comments, Tips & Photos! I’m never sure when it will happen. But certain “06880” posts elicit dozens of comments. Naturally, some of them wander far from the original topic. A recent post on commuter train etiquette is a great example. One reader cited a 1975 New York Times story about a private railroad car “serving about 65 top NY business executives on daily trips from Southport, Conn, to Grand Central.” The price was quite a bit higher than the regular commuter fare. 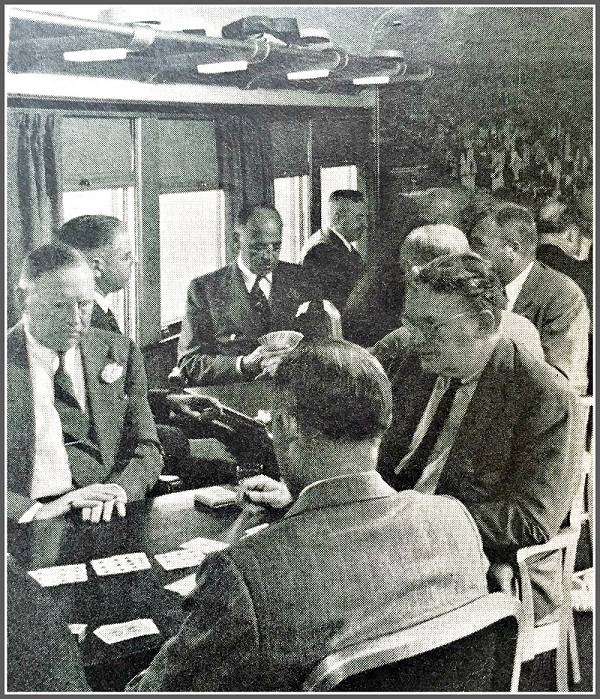 In 1949, Life magazine showed Westport commuters enjoying a card game, in an elite railroad club car. The New Haven/Penn Central provided several club cars for private membership-only groups who leased them. They featured more spacious seating and had a private attendant serving food and drinks. The cars were discontinued when the state took over in the early 70’s and bought new equipment that was incompatible with the existing club cars and declined to configure new equipment for new club cars, though the Southport Club members offered to pay “any price” for a new car. And that brought an email from Bonnie Bradley. The Westport native and longtime resident now lives upstate. But she recalls the Southport Car well. Many Westporters rode it — including her grandfather, James P. Bradley. “Every workday from the early 1930s through the early ’50s he rode the Southport Club Car (which stopped in Westport). 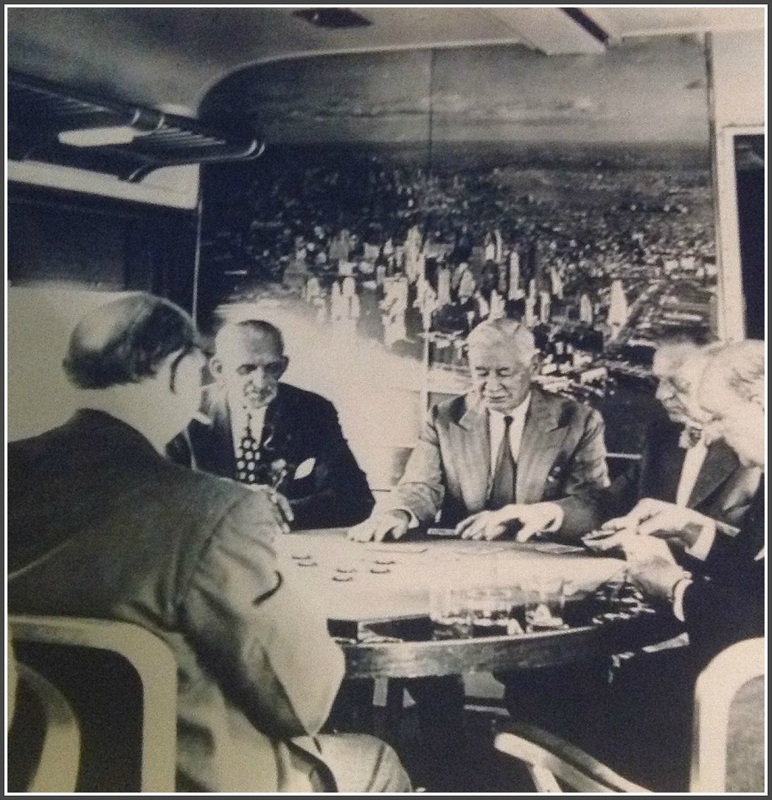 He and his cronies, including Fred Bedford, played poker every day in the Southport Club Car. Here are the cards he held on December 3, 1956, when he won a hand with a once-in-a-lifetime event. 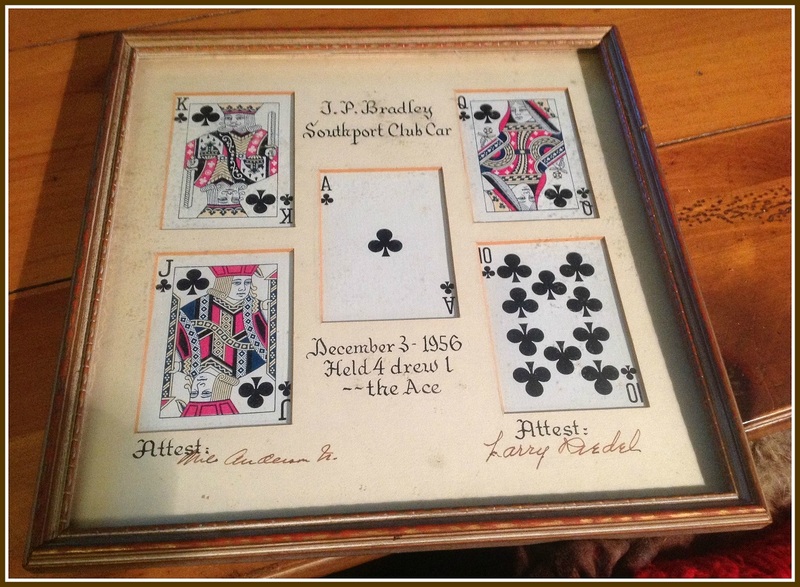 His poker mates took the cards, signed their names, and had them framed for him. Does anyone play cards on the train anymore? Does anyone talk to anyone else, in fact — beyond someone Very Important on the other end of a cell phone? Why should they? We’ve got podcasts, Spotify, laptops and tablets. There’s work to be done, or so many ways to entertain ourselves. We’ve come a long way since 1956. SUBSCRIBE TO '06880' BY EMAIL -- IT'S FREE! Please support “06880” — thanks! This blog is personal opinion, and is not representative of the views of the Westport School District or Board of Education.